Obamacare didn’t come with ”death panels,” like conservatives claimed it would. So, Republican governors and state legislatures formed their own. Until the death of Charlene Dill, the victims of those death panels were invisible. Conservatives constantly say that poor people are lazy. That hardly applied to Charlene Dill, a 32-year-old mother of three in Orlando, Florida. Dill worked at three different jobs to support herself and her children, and pay for a divorce from her estranged husband. The working poor are a lot like Charlene Dill. They work in low-wage jobs that don’t pay livable wages. Worse, they’re punished for working, because they become ineligible for state assistance programs. Charlene Dill earned about $11,000 a year from her three jobs. It doesn’t sound like much, but it was actually too much. Dill’s earnings were well below the federal poverty rate — $23,850 per year for a family of four. But state governments administer Medicaid and set their own eligibility requirements. Dill earned too much to qualify for Florida’s Medicaid program, which puts an income cap on eligibility. Dill needed to earn less than $4,535 per year to qualify. Like millions of Americans before health care reform, Charlene Dill was trapped in the “Red State Donut Hole.” She earned too much to qualify for Medicaid, and to little afford private insurance. So, she lived and worked every day with untreated pulmonary stenosis, because she didn’t have health insurance. The Supreme Court upheld the Affordable Care Act, but opened the door for states to reject the law’s expansion of Medicaid. In a show of political opportunism and depraved indifference towards the poor, Republican governors and legislatures in 19 states opted out of the Medicaid expansion. The majority of Floridians want the Medicaid expansion. But Florida Gov. Rick Scott and the Florida legislature rejected $51 billion from the federal government to give health insurance to 750,000 low-income Floridians, including Charlene Dill. Republicans claim the federal government won’t come through with the money, and Florida can’t afford the expansion on its own. But the federal government would pay all the costs of Florida’s expansion until 2020 and 90 percent afterwards. The states that rejected the Medicaid expansion have the most to gain from it. Some 8.5 million Americans in these states would be eligible for coverage under the expansion. For these Americans, it could be a matter of life and death. A recent study published n the Journal of American Medicine, showed that adults in these states have more health problems. Some — like high blood pressure, heart problems, cancer, stroke and emphysema — can be fatal if untreated. Are Republicans literally killing their constituents by refusing to expand Medicaid? No, but they’re letting them die. It’s a stretch to say that Charlene Dill died because Florida Republicans rejected the Medicaid expansion. Dill died because of an untreated heart condition. Even if Florida had expanded its Medicaid program, she might still have died. But access to health care, treatment, and medications would have given her a fighting chance. Expanding Medicaid saves lives. A 2012 Harvard University study published in the New England Journal of Medicine showed that when states expanded their Medicaid programs, giving more poor people health insurance, fewer people died. Now, a new study from Harvard researchers, published in Health Affairs estimates that 7,115 to 17,104 people will die needlessly in states where conservatives lawmakers have rejected the Medicaid expansion. So why are conservatives so willing to just let people like Charlene Dill die? Ever since the “Let Him Die” moment at the 2011 Republican presidential debate in Florida, it’s been clear that element of the right does fit Grayson’s description. But what I’ve read from conservatives addressing Dill’s death, the tone isn’t so much sadistic glee as moral concern. Their questions either suggest that “she would have died anyway” or frame it as her own fault. In the conservative worldview defined by George Lakoff in Moral Politics, material wealth indicates moral strength, and lack thereof indicates moral weakness. Poverty equals poor character. That worldview puts Charlene Dill’s death in the context of her poverty, and expands upon Ryan’s and Grayson’s statements. Republican policy reflects a belief that wealth indicates moral virtue while poverty indicates moral weakness. The former must be rewarded while the latter must be punished — or at least not encouraged with government programs to alleviate poverty and its effects. 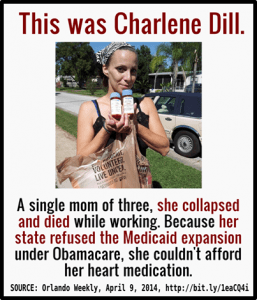 Conservatives are willing to let poor and struggling people like Charlene Dill die because they believe poverty itself is a moral failure. Thus saving the Charlene Dills of the world is immoral.